A young male variegated meadowhawk dragonfly, Sympetrum corruptum, found a perfect perch--a seed ball of Mexican sunflower (Tithonia) in our pollinator garden in Vacaville, Calif. It towered over the garden and so did he. 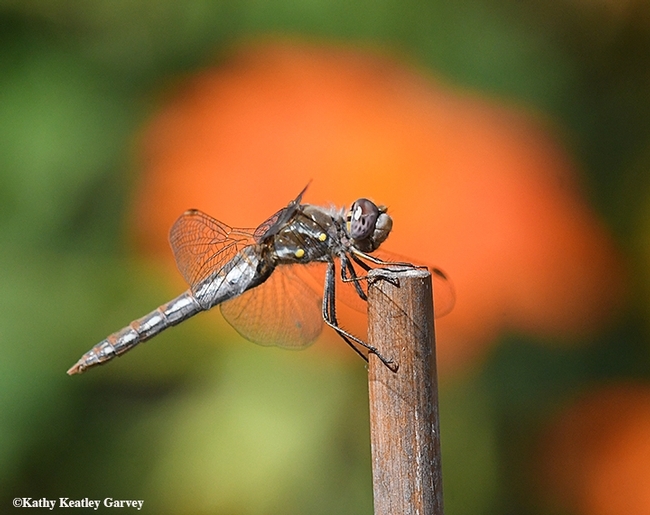 Naturalist Greg Kareofelas, Bohart Museum of Entomology associate, University of California, Davis, has been seeing and photographing some of these migrating dragonflies in his yard in Davis as well. 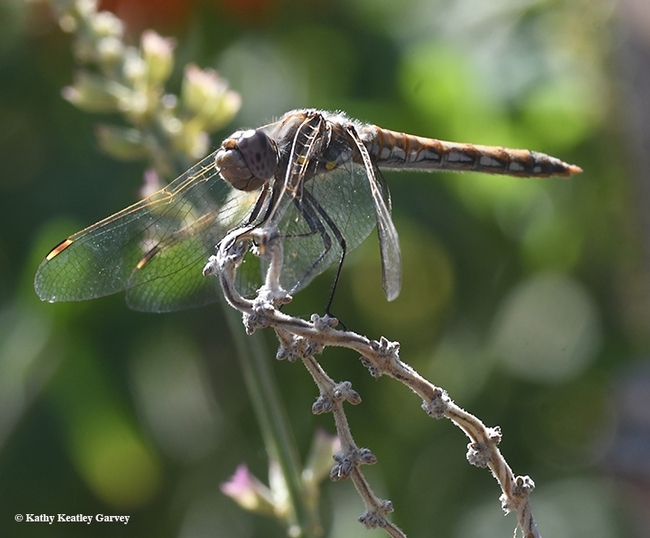 "Evidently, there was a big migration of lots of these dragonflies south of San Francisco," Kareofelas noted in his Facebook post. And apparently thousands have been spotted at Half Moon Bay. 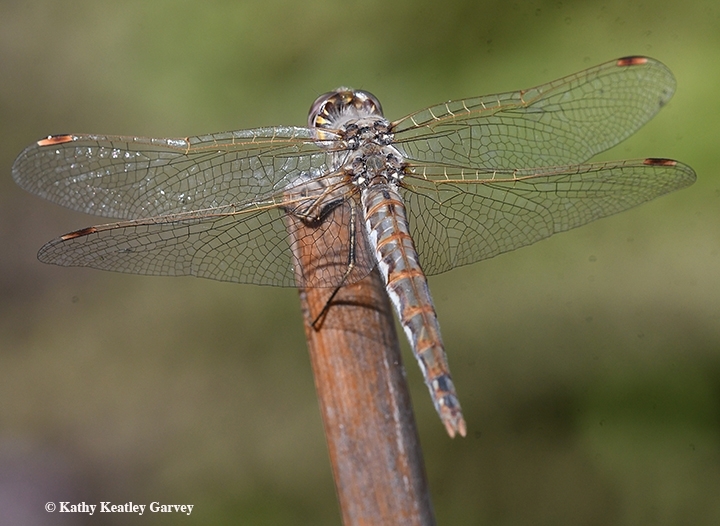 Dragonfly alert! 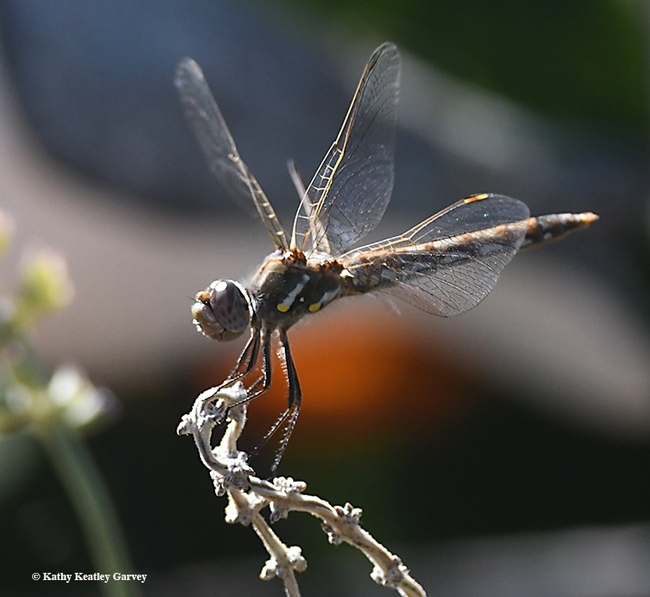 Variegated meadowhawks live near ponds, lakes, and swamps. They are largely tan or gray with a pale face that is tan in young males and females but becomes red in mature males, according to Odonatacentral.org. They're found throughout the United States and southern Canada; also Mexico south to Belize and Honduras. "This species may be seen on the ground more than other meadowhawks. It will also readily perch on the tips of grass stems and tree branches. It can be numerous flying over roads, lawns, meadows, marshes and ponds...It is largely tan or gray with a pale face that is tan in young males and females but becomes red in mature males." 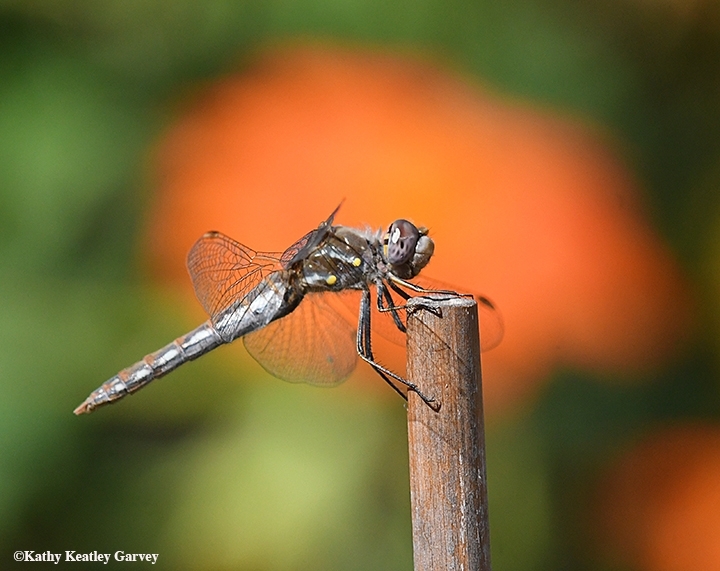 The Bohart Museum, located in Room 1124 of the Academic Surge building on Crocker Lane, offers a beautiful dragonfly poster, "Dragonflies of California," in its gift shop. 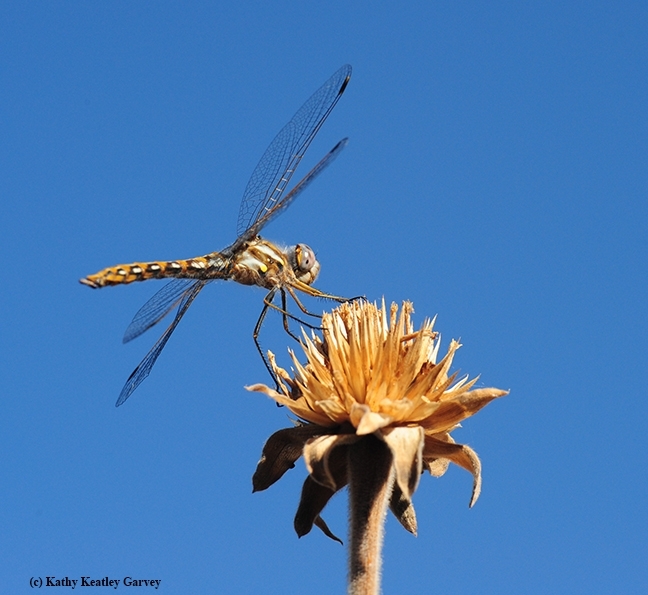 It's the work of entomologist Fran Keller (she received her doctorate in entomology from UC Davis and is now an assistant professor at Folsom Lake College) and Kareofelas, whose expertise includes butterflies and dragonflies. 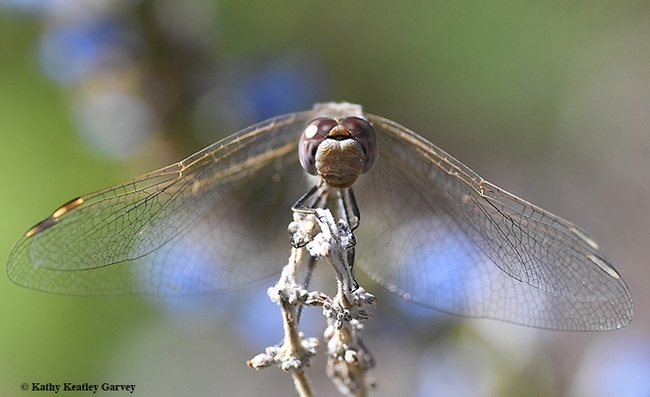 Dragonflies are fierce predators but they are predator-shy. "If it looks like a duck, swims like a duck, and quacks like a duck, then it probably is a duck," as the saying goes. If you look like a predator, walk or fly like a predator and act like a predator, that dragonfly perched near you will take off. The other day a variegated meadowhawk dragonfly, landed on a bamboo stake in our yard. 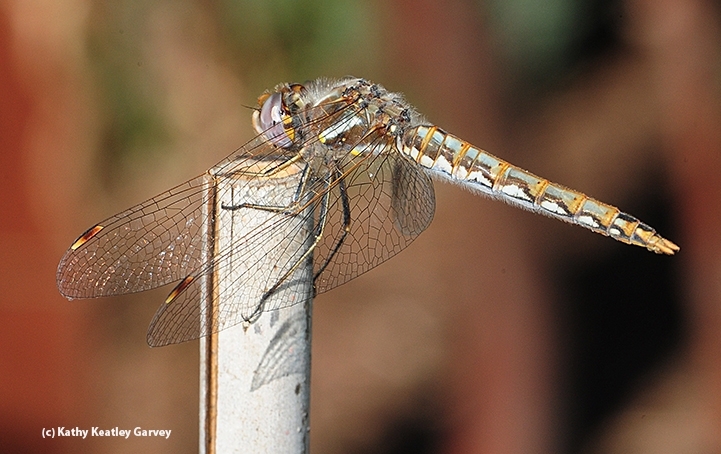 It was identified as a "mature female Sympetrum corruptum" by dragonfly expert Rosser Garrison, a senior insect biosystematist in the California Department of Food and Agriculture's Plant Pest Diagnostics Branch, Sacramento, and by naturalist Greg Kareofelas, an associate at the Bohart Museum of Entomology, University of California, Davis. How do you "catch" a dragonfly, that is, get close enough to photograph it? It helps to have a professional camera, fast shutter and a long lens, like a 200mm. Sometimes you can photograph them with a 105mm lens. To get this photo, I pretended to be part of a butterfly bush. I left my tripod behind and edged slowly, closer and closer, camera poised at the ready (a sudden movement and the dragonfly will be in the next zip code), focused, and clicked. A stiff breeze draped her wings over her head as if she were playing hide 'n seek. Oftentimes, I'll sit in a chair and wait for them to return to the perch. They often do. 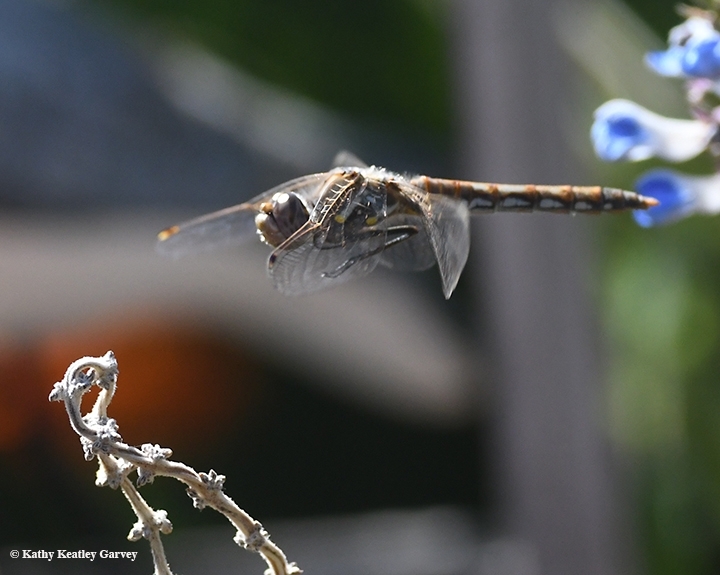 "Just as the sun was setting last night, I noticed many dragonflies flying in my backyard," Kareofelas said. "They were flying very quickly and very high, but every so often one would swoop down and land. When they do, you can approach slowly and get close. 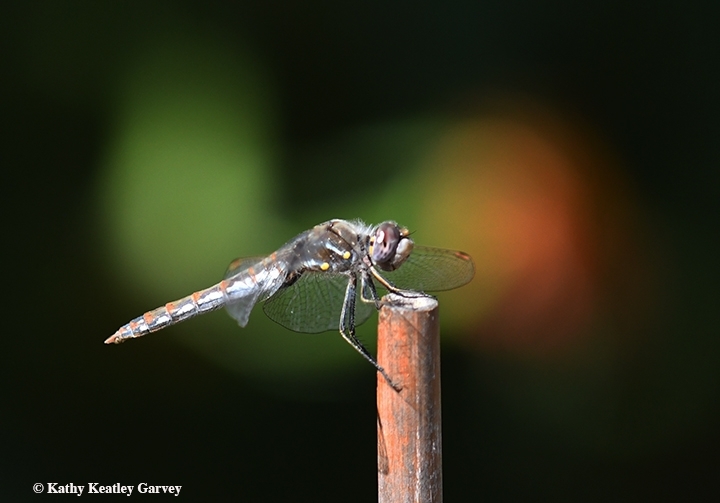 When you approach a perched dragonfly, slowly stoop as you get closer. 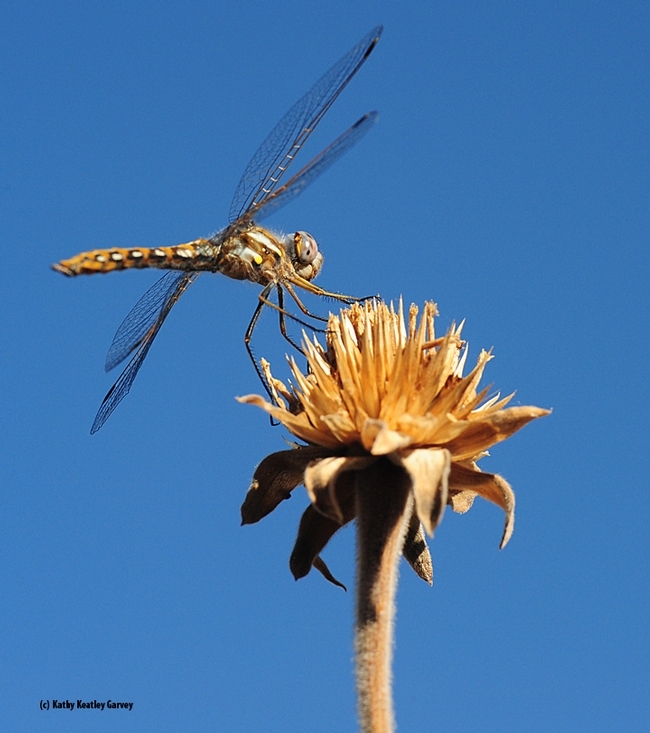 Many times, if you do not appear larger as you get closer, the dragonfly does not realize you are getting close." 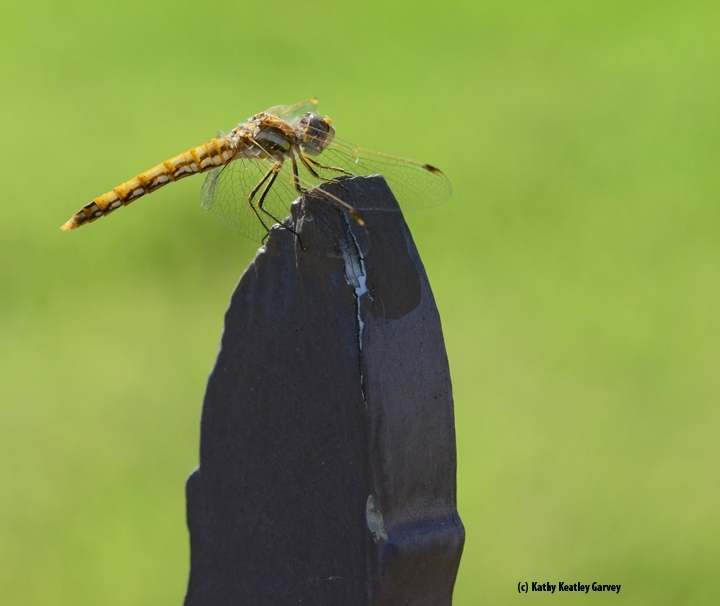 The variegated meadowhawk is one of the dragonflies on a Bohart Museum of Entomology poster, the work of entomologist Fran Keller and Kareofelas. Its habitat ranges from throughout much of the United States to British Columbia and Canada. It's found as far south as Honduras, and as far west as eastern Asia. It hangs around ponds, lakes and swamps to catch its prey. 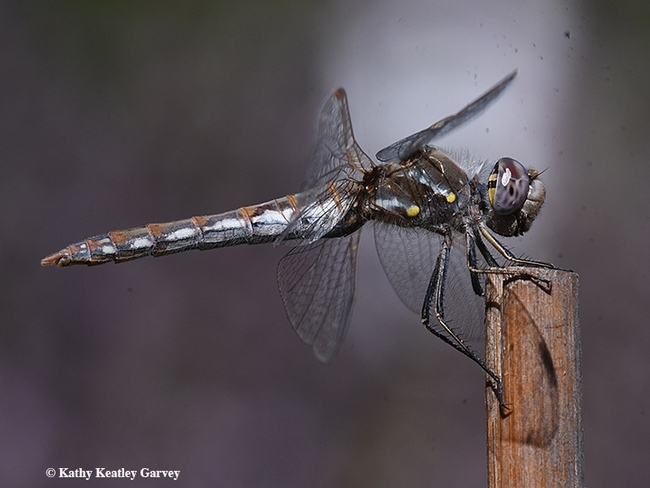 if you don't look, move or act like prey, you, too, can "catch" a dragonfly.